Anne's Food: Happy 7th birthday, blog! Really, seven years of blogging? I can't believe it's been that long. It feels like it was only yesterday I was walking to work, talking to myself about food (and um, yes, I do that quite a bit) and decided that I might as well start sharing it with the world. Because that was really why I started. And why I keep at it..? It's still the need to talk. I have things to say. And I'm so grateful that I have readers that apparently want to talk to me. The contacts and the feedback is really what makes it so much fun. I know I've been slowing down this past year, and I might slow down even more, maybe posting 3-4 times per week rather than 6-7 - but I hope you won't mind. I usually celebrate this day with a cake. This year... I'm a bit embarrassed, but as I get SO many e-mails about this cake, I thought I'd set the record straight. What you see above (so sorry about that sucky photo) is a Daim cake, made by the company Almondy. It comes from a box, frozen. It's what's served in IKEA:s all over the world, and, honestly, it's my most requested recipe. And I've never made one. Not now, not ever. I probably won't. It's even available in gas stations, and very inexpensive. Not to mention I've never seen a recipe for it. 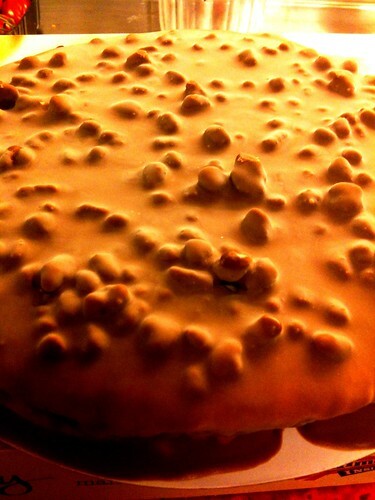 What I do have is the cake that it's based on - the original Oscar II:s cake, with almonds and buttercream. No daim though - but you could just add that, and maybe some melted chocolate too. Ok, maybe I will try to make one, eventually - but not today. I like the pre-made version just fine, so today, I'll enjoy that. For my previous birthday cakes, I've made Princess Cake, Black Forest Cake (Swedish style), Budapest Roll, Oscar II:s cake, and a humble vanilla bean jelly roll. (And that's just five, as I never managed to make a cake last year. Sorry! Time flys when your having fun. Congratulations, Anne! I've never read a blog that is 7 years old. I live in the Washington, DC area & I visit often. I also print out your recipes & use them. This year I plan to make some baked goods for the holidays, using your recipes. Thank you so much! Congrats Anne! I just love your blog. :)Whenever I need a really good recipe I check out your blog. Yesterday I made your "Kokt potatisgratäng" but I only used half the potatoes and instead I used root vegetables. Just as the potatoe gratin this was just soo good! Congratulation with your blog's birthday. Amazing how time can run. Happy Blogoversary Anne! Seven years, amazing!!! I'm only celebrating my 4th year this month. I didn't bake a cake either but, I am throwing a Cookbook Party!!! Happy blogaversary, Anne! We're nearly twins--my blog turns 7 tomorrow. That's what, 98 in blog years? Congrats! I'm hoping for at least 7 more years!